Throughout bathrooms, offices, kitchens and more, granite stones are becoming more and more sought after from specialist suppliers such as the experts here at Pure Quartz – across the UK, not just in South East London! Working with you on a range of ideas and designs, our trusted professionals will be ready to help bring a granite bathroom, granite kitchen, granite office or otherwise to life – at an affordable rate which won’t exhaust any of your household budgets. From kitchen countertops in Cimstone to a Silestone worktop or two, we work with big brands and stone suppliers to ensure that you get the best quality stone worktops and floors at the best prices in Lambeth and Bromley. Granite bathroom worktops and office countertops will be designed with you in mind each and every step of the way. You won’t have to buy granite office worktops or otherwise from us until you’re completely happy. Our aim is to invest you in your new home refurbishment or redesign as fully as possible – so that you retain complete control and that our experts can be on hand to help whenever you need us. As kitchen top suppliers with years of experience in providing stunning quality granite to homes in South East London. You can depend on us for the best bathroom worktops in granite, quartz and more – that money can buy. Are you interested in different varieties and colours of granite to help embellish your new kitchen or bathroom design? Hoping to redo your floor in stunning granite to create a whole new look for your home? We can help. We trade in replacement kitchen worktops and budget kitchen worktops, too – meaning that if it’s your cooking and eating space that needs a fresh touch of granite to help bring things into the modern age, we will be on hand to supply and install just that. 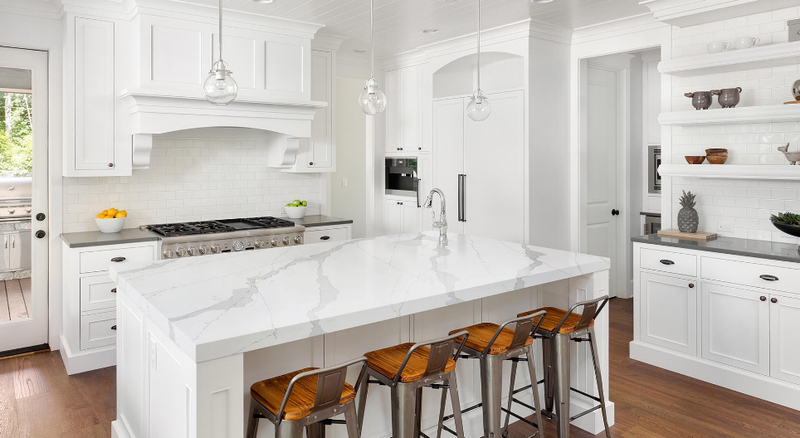 Caesarstone and Lunastone granite and more besides are available from our supplier and store, meaning that you can always rest assured that you are receiving the best quality natural stone for the best prices in your area. We have that ‘near me’ approach, too – our friendly team love installing luxury worktops, floors and more besides – and high quality granite is just one of our specialities. While working with us, we will find the best possible look for you and your tastes – as well as your existing décor. Pure Quartz thrives on custom and bespoke projects and needs – we’re here to help. From designs to installations, we will source the best quality natural granite for the job and will make sure that everything is fitted and ready to your expectations. You can buy now and pay once you’re fully satisfied, too – and with Quartz Care, we can be on hand to make sure that your bespoke granite worktops look great for years to come. Call us today on 01233 733111 or email us with your details and we look forward to discussing your project with you.